In stock -This product will ship today if ordered within the next 4 hours and 48 minutes. Nature`s Answer Turmeric-3 is an alcohol free, kosher fluid extract, offering 200mg per serving. The Genius of Mother Nature in every bottle -Just as she intended! "The true value of a plant lies deep within its natural holistic balance." Frank D`Amelio, Sr. Founder, Natures Answer. With one of the most comprehensive herbarium in the world, Nature`s Answer has identified mother nature`s unique botanical fingerprint on over 800 plant reference standards. Utilising advanced botanical fingerprint technology, these authenticated samples each serve as the standard by which all incoming raw materials are judged. Using carefully-controlled extraction techniques, Nature`s Answer capture the holistic balance of each herb and value is passed on to you, the consumer, who can be assured that the product in your hand is authentic, safe, effective, holistically balanced, and of course... Nature`s Answer. Super concentrated from 5,000 mg of turmeric Rhizome. Other Ingredients: Vegetable Glycerin, Purified Water, Extra Virgin Olive Oil, Sunflower Lecithin, Citric Acid, Xanthan Gum. Take 1ml (28 drops) one to three times a day in a small amount of water, with food. 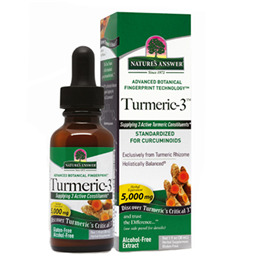 Below are reviews of Nature`s Answer Turmeric-3 - 30ml by bodykind customers. If you have tried this product we'd love to hear what you think so please leave a review.